We bring in for our clients Waterjet Optional Accessories that has the capability of storing abrasive and delivers the abrasive to the bucket automatically. The design shows our continuous effort to improve efficiency and reduce labor requirement. 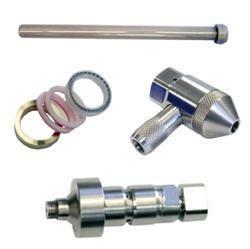 We are the leading manufacturer and supplier of Waterjet Spares made from high quality material. In spite of the fact that not as exact as laser cutting, waterjet spares can cut thicker material without causing harm. Considered a "grating" process, water fly cutting uses a rough material joined with water in a very thought stream to "dissolve" or separate the material being cut. The water flying devices are significantly more adequate to be utilized with thicker materials and additionally those that are touchy and powerless to harm under extraordinary warmth. Safety measures should likewise be brought when cutting metal with a water fly instrument. The material must be dried immediately subsequent to slicing to abstain from rusting. Innovative work in the field of waterjet cutting innovation is progressively centered on enhancement and mechanization of the cutting procedure. 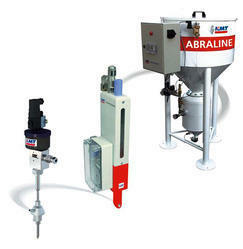 As a main supplier of cutting edge AMS III Abrasive Management System, we offer our clients more than others. This administration framework controls the whole grating supply stream of the waterjet cutting machine, from separating of the rough to checking the cutting procedure, guaranteeing streamlined cutting outcomes. The measure of grating utilized is a key cost factor for the operation of a waterjet cutting unit. Enhanced control of all modules in this way does not just help accomplish exactness cuts; it likewise decreases the expenses for consumables, consequently giving you a reasonable aggressive edge. Our organization is involved in offering extensive range of AMS III - Active Autoline II that is fabricated in accordance with the international standard that ensures high performance at users end. Our range of AMS III abrasive management system is available in models of AMS III S SC 4.3: for single head machines, AMS III D SC 4.3: for dual head machines, AMS III T SC 4.3: for triple head machines and AMS III Q SC 4.3: for four-head machines. Looking for Waterjet Spares ?